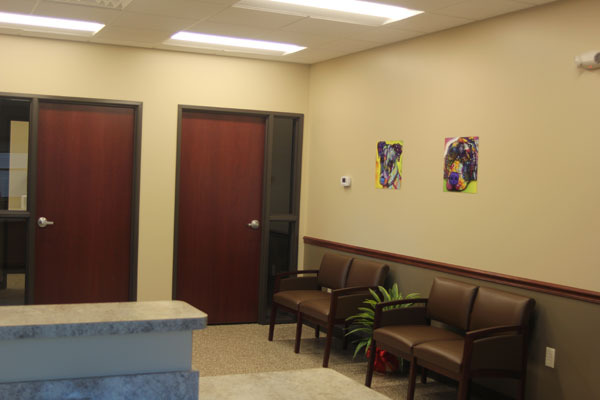 Our lobby is designed for the comfort of our clients and patients. The recessed scale makes it easy to weigh our larger dogs without them having to step onto a raised platform. 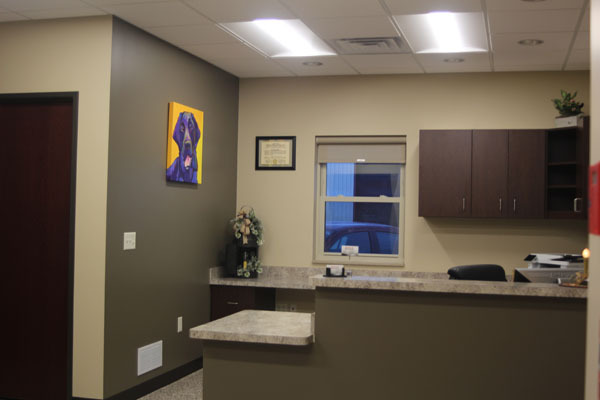 We have comfortable seating and a waiting room TV for clients needing a place to rest prior to an appointment. 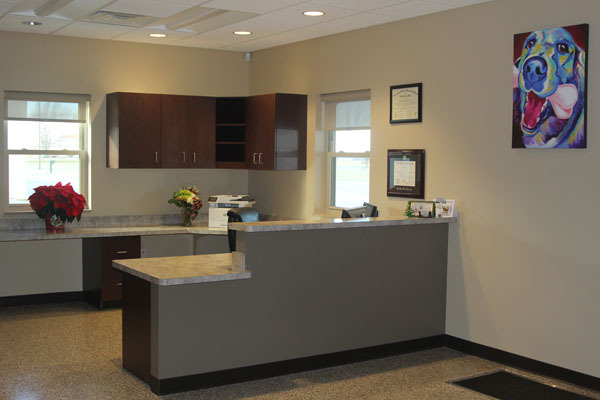 Our goal is to see all of our patients in a timely manner based on their scheduled appointment. Therefore, most clients won’t wait long in the waiting room. Our reception counter is ADA certified with a lower level for anyone in a wheelchair. We have two patient exam rooms. They both feature a viewing window to allow patients to look out of the room into the lobby. This seems to alleviate stress in some pets. 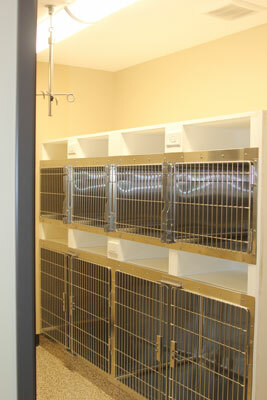 We have exam tables for our smaller patients that can be folded up against the wall for larger dogs. 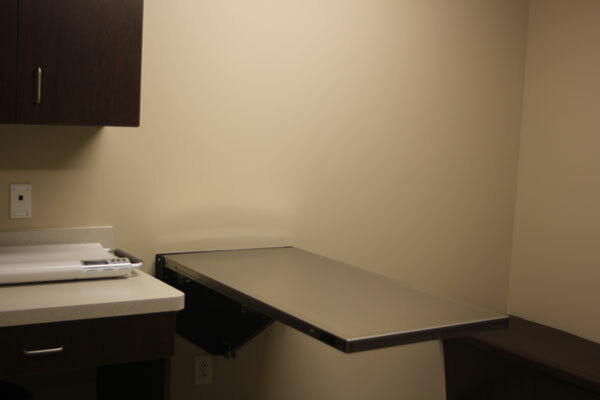 Our exam rooms have built-in seating for our clients and are large enough to accommodate several family members. All rooms are cleaned after each visit for the safety of our next visitor. Our pharmacy is stocked with many of the common medications needed to treat our patients. We provide this as a service to our busy clients. We also offer an online store to those clients that are looking for a safe area to shop for their pets after- hours. Our laboratory features a microscope, multiple in- house rapid disease tests and comprehensive in-house blood analysis to run complete blood counts and chemistry profiles. Any tests that we cannot provide at our facility are sent overnight to a certified laboratory in Cleveland, Ohio. 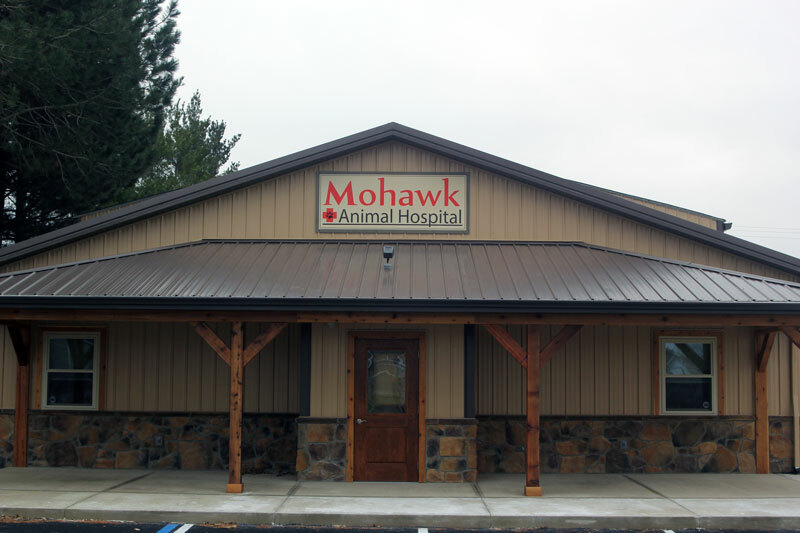 We are very excited and proud of our separate dog and cat hospital rooms. 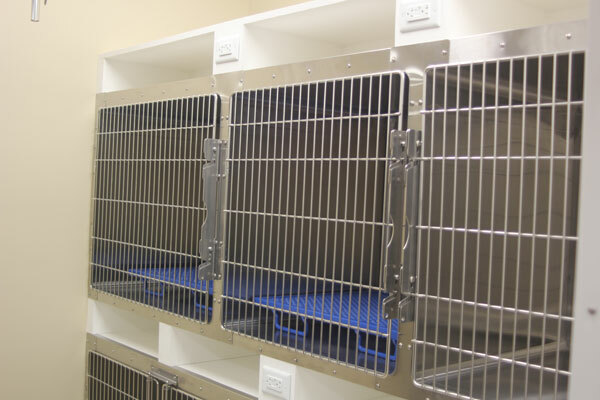 These rooms feature stainless steel cages that were custom designed with individual patient cubby’s. 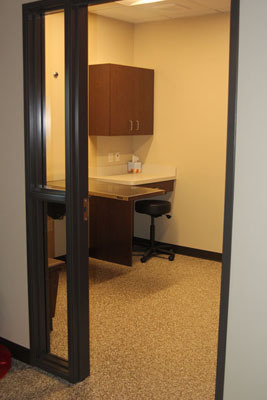 These cubby spaces provide an area for the individual patient belongings as well as their medical chart and medications. This design helps to ensure the safety of each of our patients as well as their personal items and special foods. We welcome personal items for our patients to alleviate their stress when they are away from home and family. The units are also designed with built-in electrical outlets and IV racks for our more in-depth hospitalized patients. 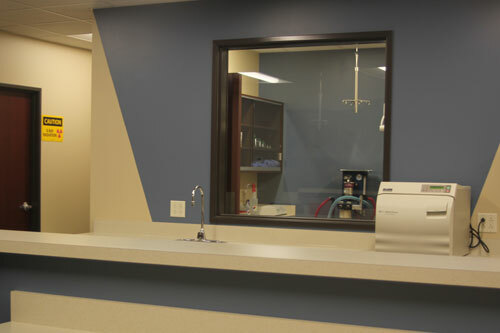 Both rooms have large viewing windows so that pets can be observed from many different angles in our open treatment room. This allows us to continually monitor an animal’s behavior even when we are not in the hospital room. 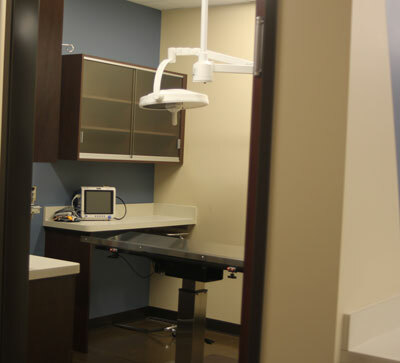 Our radiology room features high- quality, state of the art digital imaging. All images are captured in a digital format and can be provided to our clients via email or DVD. We can also submit images to specialists if needed with the click of a button. 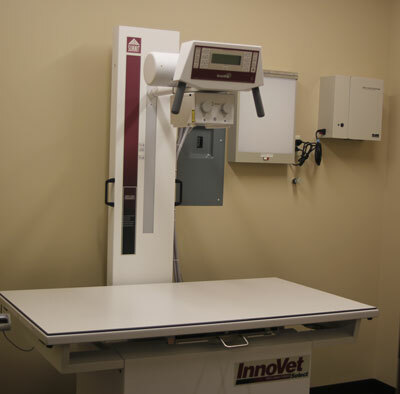 This allows us to provide clients with all information pertaining to their pet’s illness or injury in a timely fashion. We can also obtain second opinions and better treatment estimates should specialty care be necessary. 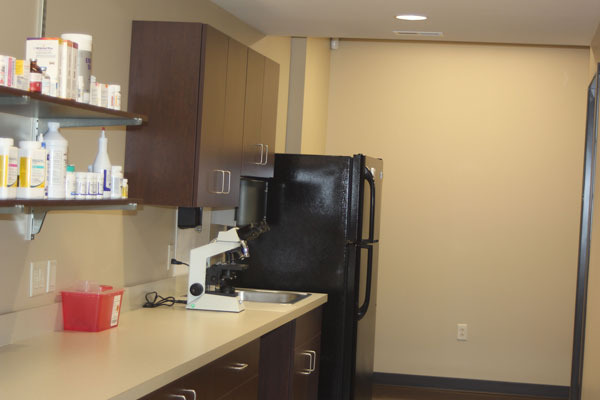 Our open-area treatment room is the hub of our daily patient care. We have an island area adjacent to an electric lift table for working with our inpatients. 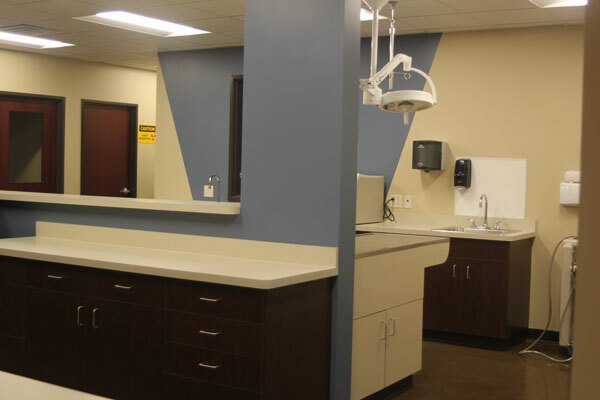 There is also a wet prep table for dental procedures, bathing and wound care. 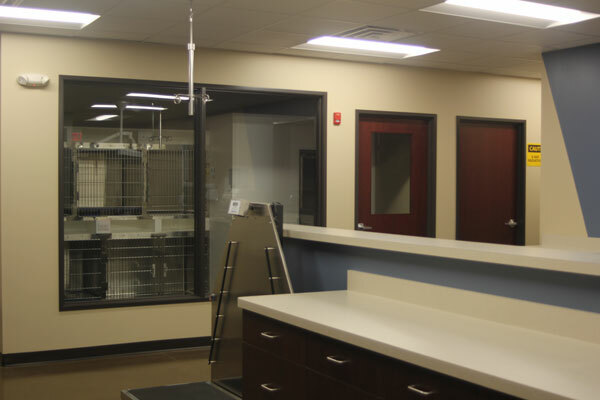 This central treatment area features viewing windows into the cat hospital room, dog hospital room as well as the surgery room. 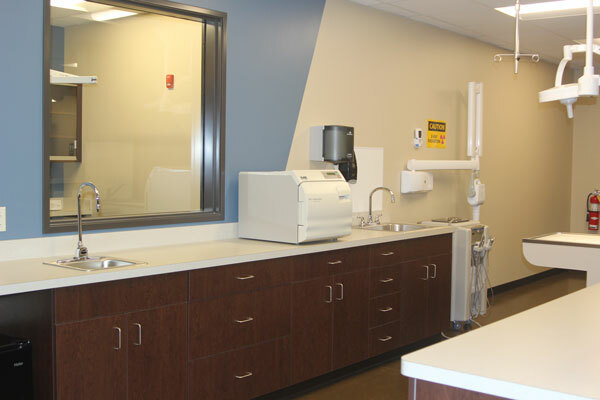 We have central scavenger connections for our gas anesthetic machine and a dedicated surgery prep area for sterilizing instruments for surgery. Surgery is a separate room with individual ventilation for proper air quality. We have gas anesthesia, oxygen supply, heating for the surgery table, ECG monitors, blood pressure monitors, body temperature sensors and many other surgical and anesthetic monitoring equipment pieces to ensure the safety of our patients. There is a viewing window from the surgical room to the treatment room so that all staff members can easily communicate no matter what task they are completing. 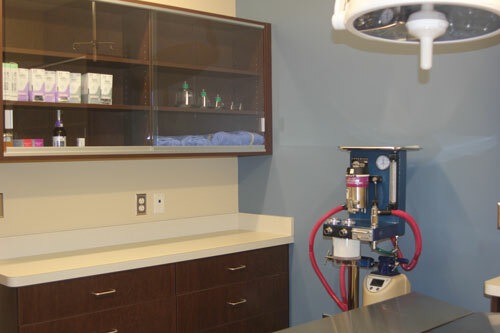 We have an area of our treatment room designed specifically for canine and feline dental procedures. There is a dental table/sink for our patients that allows water used during the procedure to drain away from the patient. Patients are kept warm on the table with blankets and heating devices during the dental cleanings. 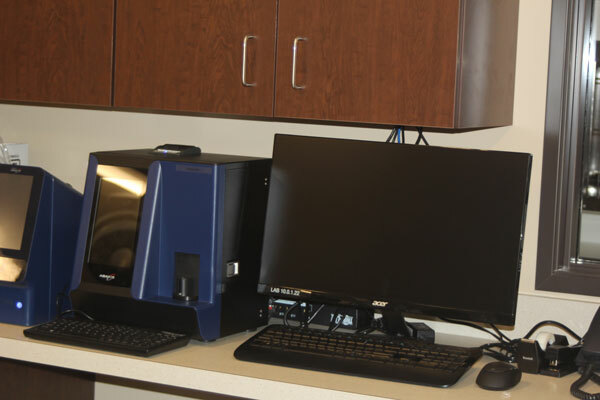 We have a digital dental xray unit specifically designed to obtain detailed images of tooth roots and crowns. 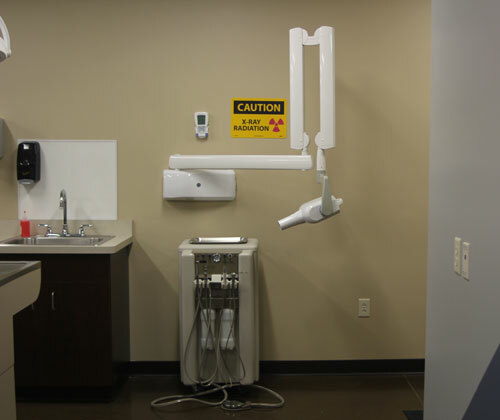 The high- speed drill and dental scaler/polisher unit is available for all of our patients’ needs. We have dedicated surgical lighting in this section of the treatment room to provide for proper visualization of the teeth and gingiva.